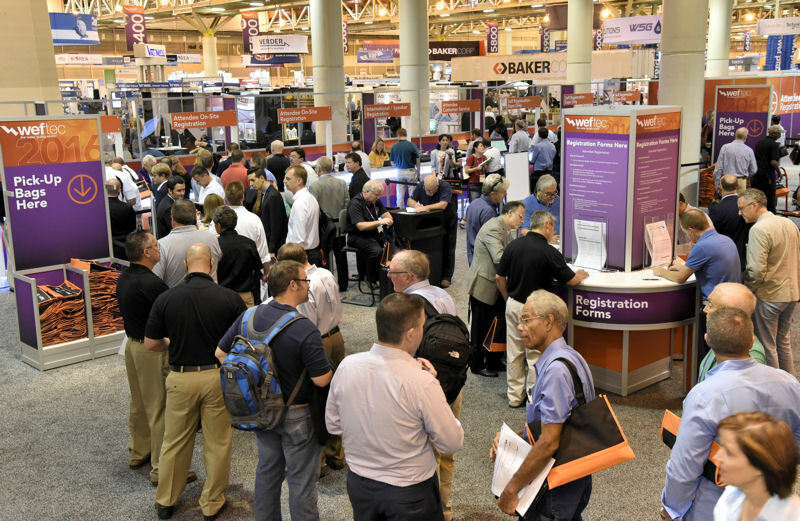 WEFTEC 2016 attendees explore the exhibition. Photos courtesy of Oscar & Associates. 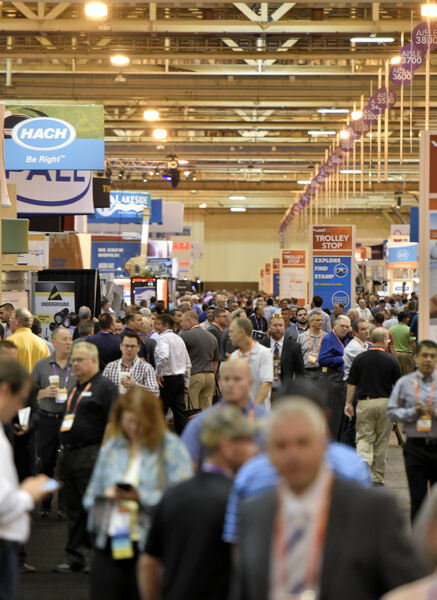 Even in its 90th year, the annual Water Environment Federation (WEF; Alexandria, Va.) Technical Exhibition and Conference (WEFTEC®) continues to grow while maintaining top-notch content. Water quality professionals from around the world will congregate Sept. 30–Oct. 4 at Chicago’s McCormick Place for the largest water quality conference and exhibition in North America. The conference features more than 1000 companies using 28,242 m2 (304,000 ft2) of exhibition space and more than 200 events. WEFTEC registrants can take advantage of this opportunity to attend expert-led lectures and seminars, to network with peers, and to see groundbreaking technology. WEFTEC 2016 attendees line up to register. Photos courtesy of Oscar & Associates. Visit the WEFTEC 2017 registration booth, located in hall B, level 3 of the convention center’s north building. Pre-registered attendees will check in to receive a name badge. Others will be able to register on-site. Download the WEFTEC 2017 mobile app to access up-to-the-minute conference information and build a personal schedule. The WEFTEC 2017 Conference Program and Exhibitor Guide also can help you find specific events by time or topic area. Participating in WEFTEC events may help attendees earn continuing education units, professional development hours, or contact hours. Learn more about earning educational credits online. Follow @WEFTEC on social media and join in the conversation using #WEFTEC17. WEFTEC also represents an opportunity to engage with new perspectives, leave a lasting mark on the local water environment, and watch sector leaders in action. Learn more about some of these events below. Fredi Lajvardi will give a keynote speech during the WEFTEC 2017 Opening General Session that focuses on mentoring a new generation. Photo courtesy of Keppler Speakers Bureau (Washington, D.C.). In 2004, Science, Technology, Engineering, and Mathematics educator Fredi Lajvardi led a team of disadvantaged high-school students to victory over engineering universities in an underwater robotics competition. 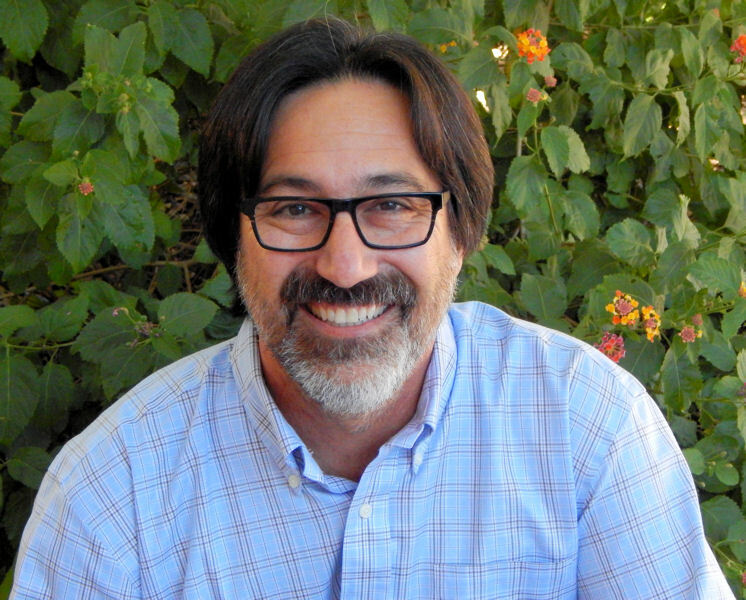 Lajvardi will bring his message of promoting mentorship during his keynote speech. Ifetayo Venner, global leader of water supply and treatment, Arcadis (Amsterdam). During this competition, talented water and wastewater professionals will showcase their skills at various duties of water resource recovery facility operators. To bring glory back to their utilities and sponsoring organizations, competitors must work in teams to excel in the Process Control, Laboratory, Safety, Collection Systems, and Godwin Maintenance events. Sept. 30, 8:30 a.m.–4 p.m. Volunteers install plants at New Orleans City Hall during WEFTEC 2016 Community Service Project. Photos courtesy of Oscar & Associates. At WEFTEC, innovation and community service aren’t just idle buzzwords. 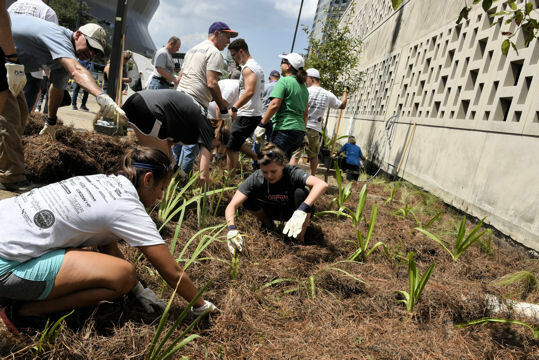 Since 2008, volunteers have helped improve the water environment of WEFTEC host cities by completing green infrastructure projects in public areas. During WEFTEC 2017, volunteers will construct bioswales and an outdoor classroom at Manierre Elementary School (Chicago). Registration for the project is free and open to all WEFTEC registrants and their guests. Participants receive transportation between the project site and Hilton Chicago, as well as a t-shirt, lunch, and an exclusive ribbon for WEFTEC badges. 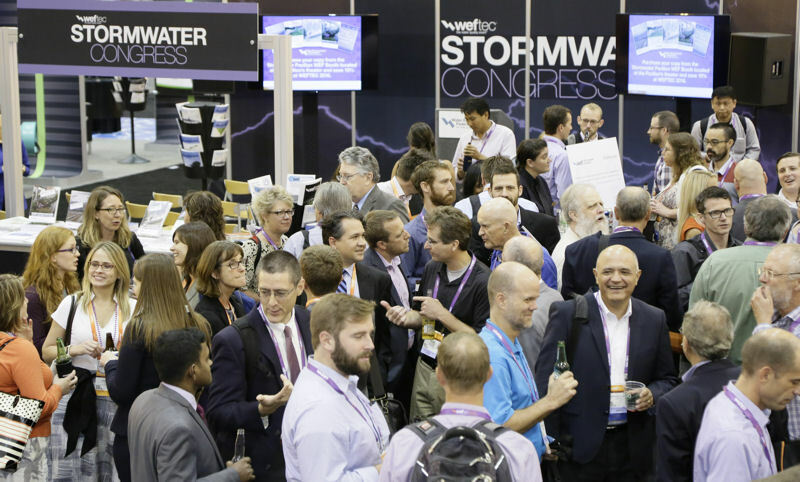 Stormwater Congress 2016 attendees network during a reception event. Photo courtesy of Oscar & Associates. Learn from stormwater thought-leaders during 15 specially tailored technical sessions and workshops. These events educate about all aspects of stormwater management. The Stormwater Pavilion, located in the 100/200 and 300/400 aisles of hall A, will be the hub for stormwater exhibitors. 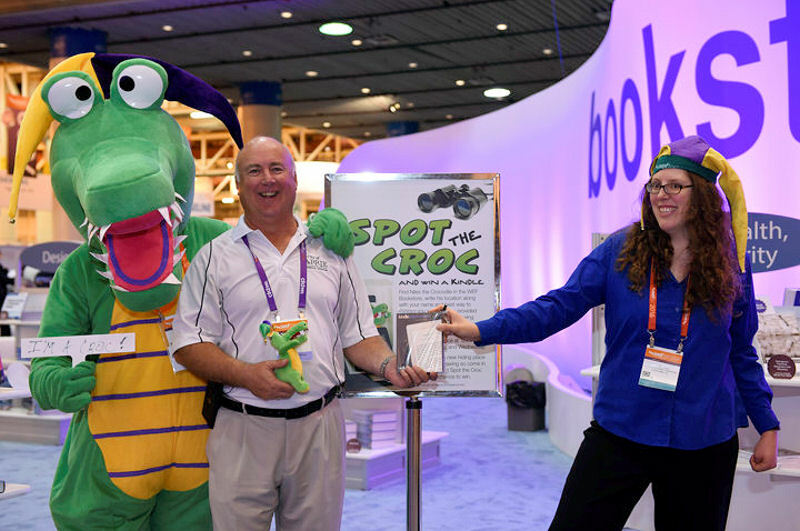 A Spot the Croc winner poses with Niles the Crocodile at WEFTEC 2016. Photo courtesy of Oscar & Associates. The bookstore will host its Spot the Croc competition. Participants who can locate Niles the Crocodile, the WEFCOM mascot, among the bookstore shelves will be entered into a drawing for a Kindle Paperwhite e-reader loaded with a WEF e-book. Drawings will be held daily, Oct. 2–4. Also, purchase many of WEF’s latest publications in the bookstore.